It’s hard not to be captivated by this bird; they’re the epitome of ethereal beauty, grace and strength, stalking and flying through our swamps and wetlands. 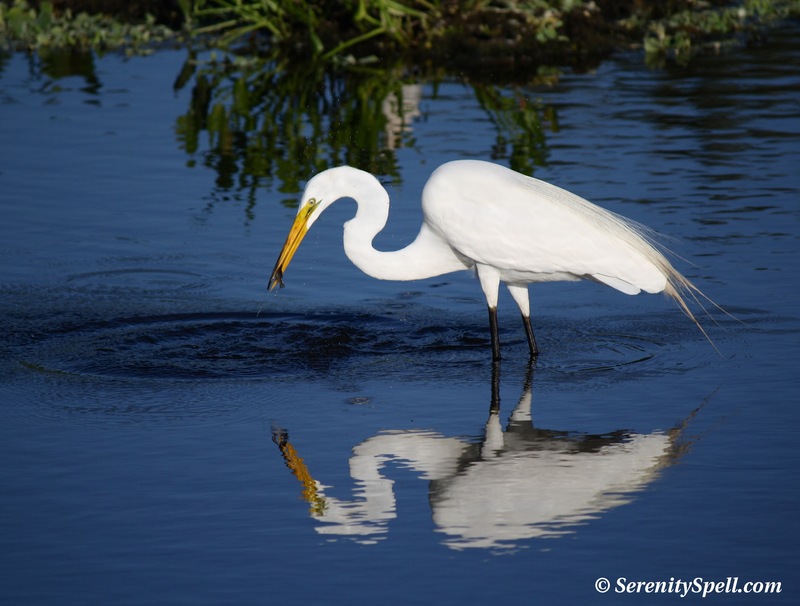 Great Egrets, also known as the Great White Egret, the American Egret, the Large Egret or Common Egret, are a common sight in our wild spaces — even our neighborhoods. They’re the largest egret in the Old World — thus the GREAT of their title. In the New World however, Great Blue Herons win the size competition. Great Egrets are large egrets boasting brilliant all-white plumage, and are found across much of the world, from southern Canada to Argentina, and in Europe, Africa, Asia, and Australia. Standing approximately 3 feet tall, great egrets have graceful necks, long black legs, and black feet. Their bills are straight, pointed, and yellow. These egrets feed by stalking, wading in the shallow water, patiently waiting for fish — then grabbing or stabbing their hapless meal with sharp bills. I’ve also seen them dine on amphibians, reptiles, and small mammals. 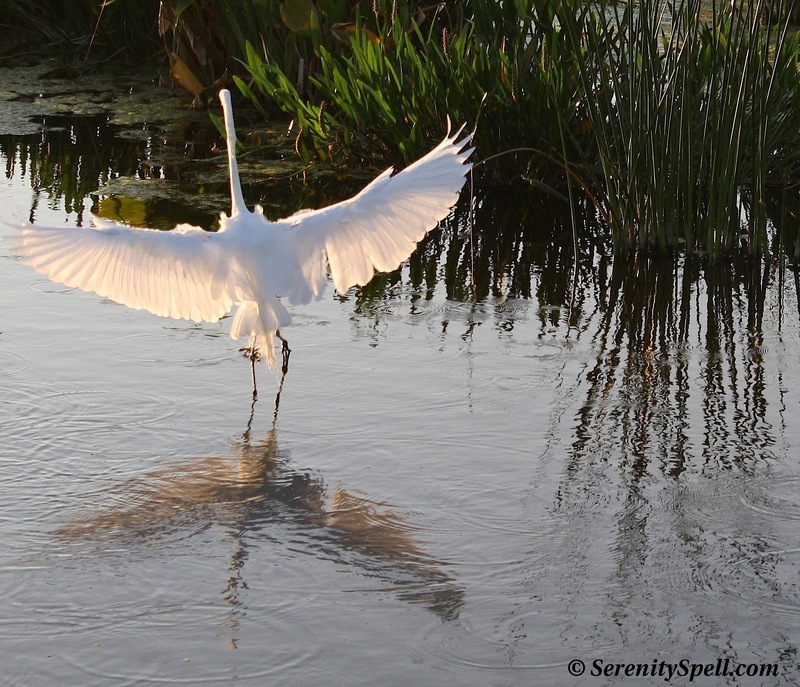 Great Egret Stalking and Catching Fish… Got It! 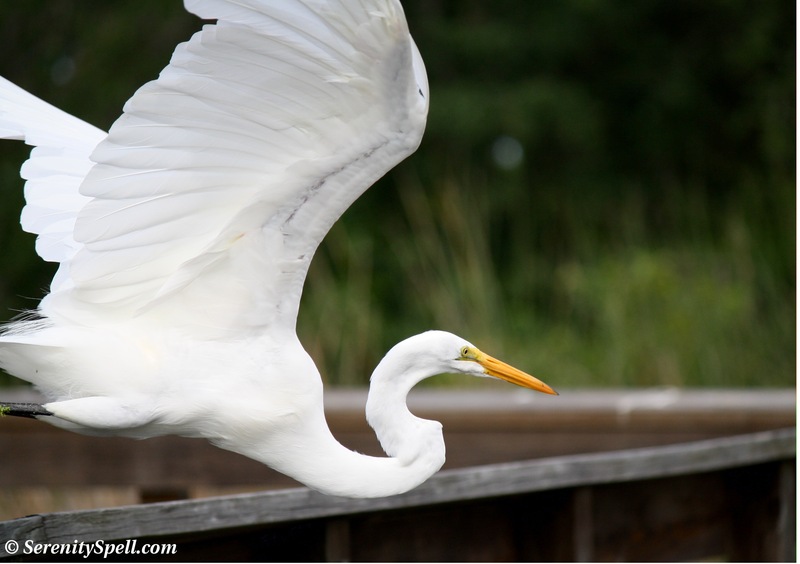 The Great Egrets in our wetlands nest in colonies with other egrets and herons. The nest is constructed of sticks and covered with vegetation, and located in trees or shrubs — or on tree-island rookeries. Not all egret hatchlings survive the nestling period — aggression is common, with the larger chicks often killing the smaller or weaker siblings. The oldest known wild Great Egret lived nearly 23 years. The feathers of the Great Egret are stunning, almost unreal; sadly, these beautiful birds were hunted mercilessly — nearly to the point of extinction, their numbers decimated by 95 percent — towards the end of the 19th century. Their breeding plumage was especially prized, and their treasured feathers were used in hats across the globe. With conservation measures enacted, their numbers grew throughout the 20th century. While wetland habitat loss is once again threatening their existence, these birds have a high adaptability to human habitation. Of course, the loss of wetland ecosystems remains another issue altogether…. In 1953 the Great Egret was chosen as the symbol of the National Audubon Society, the environmental organization formed to protect birds. During the breeding season, the Great Egret displays long, elegant plumes on its back, which are used in courtship displays. Like a peacock, the feathery plumes spread out like a fan. (Outside the breeding season, these long feathers disappear.) During this time, the lore (the area between the bill and the eyes) may turn vibrant green. Nature’s colors are brilliant, and this picture deserves its own (upcoming) post…. They are indeed angelic, hmmm I have wunderlust….. must go travelling! All of these photos are beautiful. What gorgeous birds they are. Thanks so much! 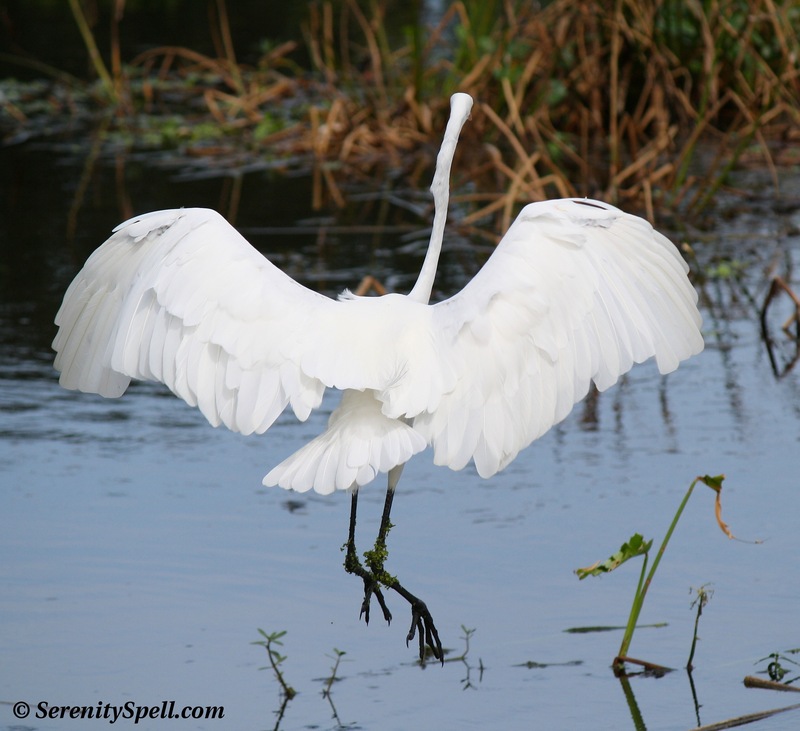 They really are spectacular; so elegant and graceful against the backdrop of our swamps. It’s wonderful to see the flash of their intense white as you’re hiking in the depths of the ‘glades. Beautiful Photos – Have a Great Weekend! Lovely birds! And, fun photos, too. I’m smiling again! YAY! So happy for the smile. 🙂 These lovelies make that an easy feat, I know. Have a wonderful weekend! Your pictures are amazing . I have egrets in my back yard along with Black crowned night green,and great blue herons. The egrets and other herons have eaten all of the baby Muscovy duck and Egyptian goose ducklings in the last week. Sad to see no babys but such is nature. Thanks so much!! They’re such a graceful capture — so easy to make beautiful. 🙂 Wow…. You have a lot of herons & egrets in your area! We have a few (depending on their mood), and you’re absolutely right — they’ve also eaten all the Muscovy duck eggs here, too! No babies this year at all. In previous years it wasn’t quite this noticeable, which is interesting… I wonder why? I actually see the ducklings taken by the Black crowned nights and Great blues. The night’s are patient and carry the ducklings about 40 ft or so and eat them whole. This morning three were lined up but have no ducklings left to take. This is the first year I ever seen so many nights out all day just wating to take them and first year none are left. I am in Delray and its a man made lake behind my house. Even otters sometimes make a visit but they are mean and bold not playful. What gorgeous pictures! 🙂 Thanks for the wonderful information you post as well, many of us would never know about these beautiful birds otherwise. How lucky are you to be exploring this amazing area! – wish I could. Thank you for sharing your love for these beautiful creatures through your words and photography. I visited Florida and went into the water areas and forgot my camera—something I will always remember! So thanks to your pictures they capture my memories. You’re so very welcome! Ah, I sadly know the trauma of forgetting my camera…or having the battery die halfway through a hike (the agony!). I’m glad I can share these memories with you; I’m fortunate to live in an area surrounded by these critters. 🙂 Many blessings! 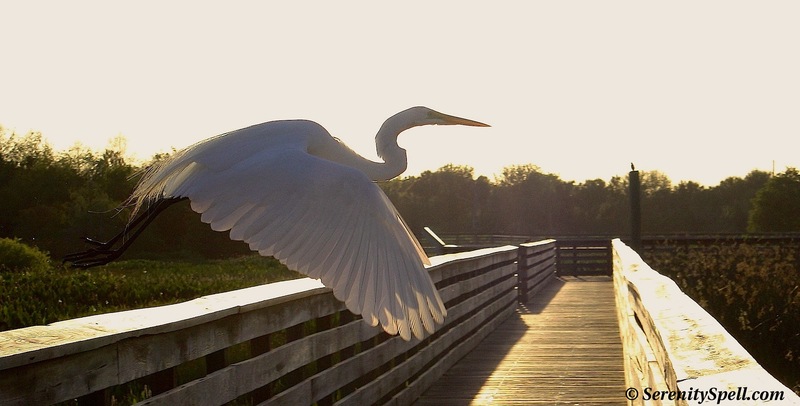 My fav photo is her flying over the wooden bridge/pier…. Awesome!